From Bulbbotz. 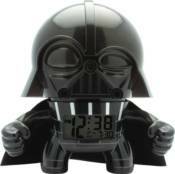 Join the dark side with this new 7-1/2' tall Darth Vader Bulbbotz Clock! Follow his lead and use your power to hunt down and destroy all Jedi! His easy to read LCD display is powered by the dark side meaning you'll never be alone in your fight to rule the galaxy. With light up and alarm functions too, you'll always be on time to fight! Comes with 2 AAA batteries.